A Substitute For Legal Tender Used For Commerce Is Called? Although it’s unlikely you’ve ever called it “scrip”, there’s a very high chance that you’ve handled and used scrip at some point in your day-to-day life. Scrip is simply any substitute for legal tender that you can redeem with one or more agents for something of value. Arcade tokens are a form of scrip since you give legal tender for coins that are used solely within the arcade, but that have actual value in that context. Gift cards are also scrip. Someone gave the store legal tender and that legal tender was turned into store credit for you, the gift card recipient, to spend at the store. Even things like the points on some credit cards that you can redeem for gift cards, discount vouchers, and such, are a form of scrip. The line “I owe my soul to the company store” was a direct nod to the practice of companies (especially remote logging and mining companies) paying their employees in company scrip that could be exchanged for food, clothing, and other necessities at a literal company store operated on the property. 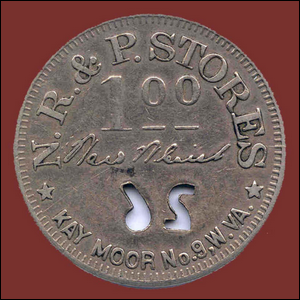 The coin seen here is an example of such company scrip, a $1 coin issued by the Low Moor Coal Company in the 1890s. While there were practical reasons for the use of company scrip (it was difficult to come by and maintain large reserves of legal tender in remote locations in the late 19th and early 20th centuries), the practice led to the kind of abuses you would expect when the company you work for issues your pay in company-backed money that is only redeemable in a company-run store. Today, the use of scrip, at least in countries with strong and established currencies and mature labor laws, is unheard of. Image courtesy of the Historic Kaymoor Collection/National Park Service.